grandma's cookie jar: just for fun - It's Winnie the Pooh Day! Nearly all children go through a stage where they love Winnie the Pooh . . . for good reason as he is soft, cuddly and a friend to children for generations! On-line it said, "One of the cuddliest holidays around has to be Winnie the Pooh Day, celebrated on the birthday of author A A Milne. It’s one special anniversary fans just can’t bear to miss! Every year, the occasion is marked with events such as teddy bears’ picnics, featuring plenty of honey on the menu. 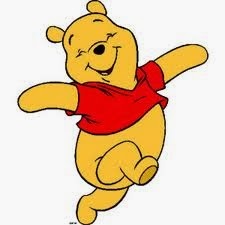 Winnie the Pooh first appeared on the printed page in 1926, together with friends Piglet, Tigger and Eeyore. All of them were based on toys owned by the author’s son, who also featured in the famous stories as Christopher Robin. The character later starred in a series of much-loved Disney films. One extra-special way to mark the day is to visit Pooh Corner in Hartfield, East Sussex, where the books were written. You can pick up a map to follow in the characters’ footsteps, and even play a game of Poohsticks on the original bridge." For those of us who live in the USA, we can gather our grandchildren, read books, watch shows and play hide-and-seek with our stuffed Winnie the Poohs! What might you do to celebrate Winnie the Pooh Day? Enjoy!